Home / Browse by Year Level / Secondary Titles / Hey, Thompson! “Hey, Thompson!” brings together the diversity of mentoring and teaching experiences that Lou Thompson has accumulated over 35 years working in the education field. The core of the book is based around the explanations, suggestions and strategies that have been stimulated by the experience of working with young people as they pass through the education system. 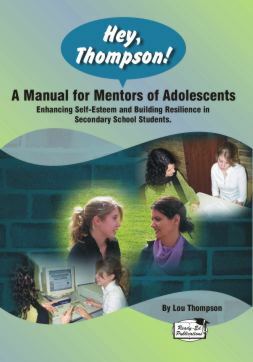 Thompson’s work in schools, teacher training institutions and universities in both Australia and New Zealand have well equipped him to present practical and effective strategies to help mentors develop enhanced self-esteem and resilience in adolescents. “Hey, Thompson!” reaffirms many of the logical and practical things parents and educators have always known are important to the actualisation of potential during these adolescent years. In this book mentors, parents and teachers will find a wealth of suggestions, strategies and tools that they can use to implement a productive and accountable mentoring programme.